well suited to the project. Looking forward, we have three intensification opportunities in Toronto that we plan to initiate in 2011.
required to obtain municipal approval. Add "West" in the thread title, please. Wow 500.000 square ft. and most likely over 20 storeys, what a comotion this is going to stir in that height conscious area, well i guess it wont be long before the Globe and Mail down the street comes out with something similar in height for their new headquarters. Like the City is appealing 12 storeys down the street, so highly unlikely and Allied suggesting to investors that this is possible is completely irresponsible. Thanks Mods for organizing these threads for me, you make me look like I know what I'm doing! I'm pretty psyched about Allied's plans, they seem to have their act together. They have a good track record of converting old brick-and-beam buildings to office use, and are now moving into developing some new space. There are so many condos being built, so it's nice to see a developer building office space outside the financial core. Their proposals add employment potential into these neighborhoods in a way that complements the existing feel, and adds vibrancy. 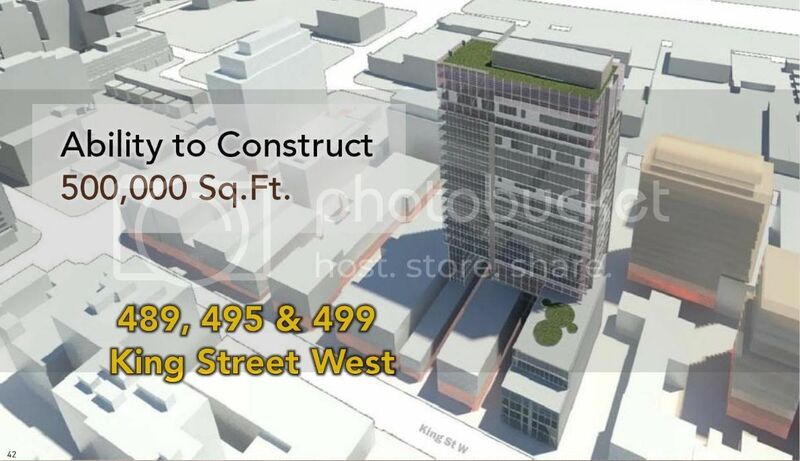 Is there an updated 3D map of King West so that we know which developments' views will be blocked by these new offices. The building in the rendering is pretty hideous. 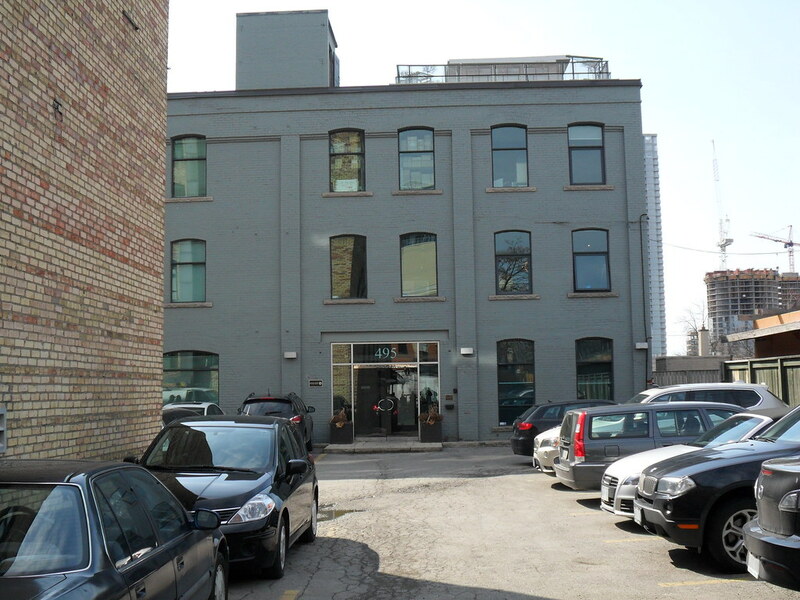 As for the height, its worth recalling that Allied proposed a large building at 544 King West, and subsequently dropped the height by 10 metres after hearing considerable opposition. Local residents voiced their opposition at the CofA, and the proposal was rejected. Allied then appealed to the OMB (what else is new) and had to subsequently adjust the height and location of the mechanical box in order to reduce shadows below. Regardless, a building of this height will continue to have a very negative tax effect on the remaining low or mid-rise warehouse buildings. Inevitably, if this is allowed to proceed (and only the OMB could let this happen) the area will quickly lose the architectural qualities that made it attractive. 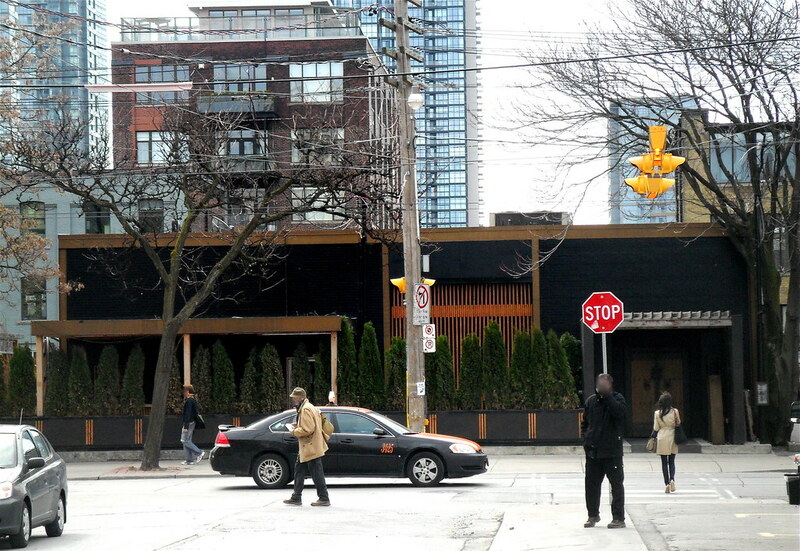 There will be immense pressure to redevelop every other low or mid-rise commercial building. Its going to get interesting down there with most likely three new developments that are going to to test the height limits for that area. It'll be a shame to lose Flynn's, as it's quite a nice pub. This is potentially disasterous. There's no way in hell they should be allowed to touch this strip. Even a mere rendering of a 25-storey building building on that site throws my confidence in Allied (fantastic Richmond+Peter project, great maintenance of century-old buildings) into doubt. What a joke! Yeah, I'm not so sure I like this either. By the looks of it they'd be completely replacing 499 (not too concerned about this one) and 495 (not good). Personally I think the only acceptable option here is to concentrate all new building efforts on 499, including the parking lot behind it, and then revitalizing the existing buildings for suitable office use. I don't like how this plan sits on top of everything, even if it is set way back. Hopefully this one goes through some serious revisions before becoming a proper project.